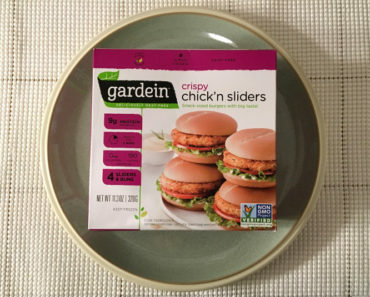 The Freezer Meal Frenzy staff includes both omnivores and vegetarians, which is why we’re always searching for meatless options in the freezer aisle. 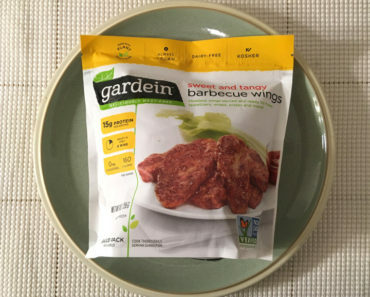 It isn’t always easy to find dishes that are meat-free; some brands don’t offer many vegetarian options. 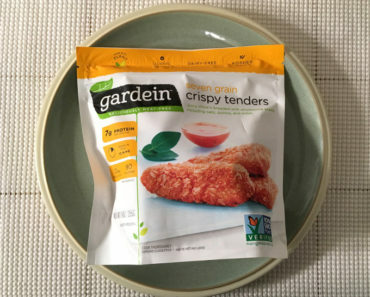 Thankfully, there are also brands like Gardein that offer tasty alternatives to meat products. 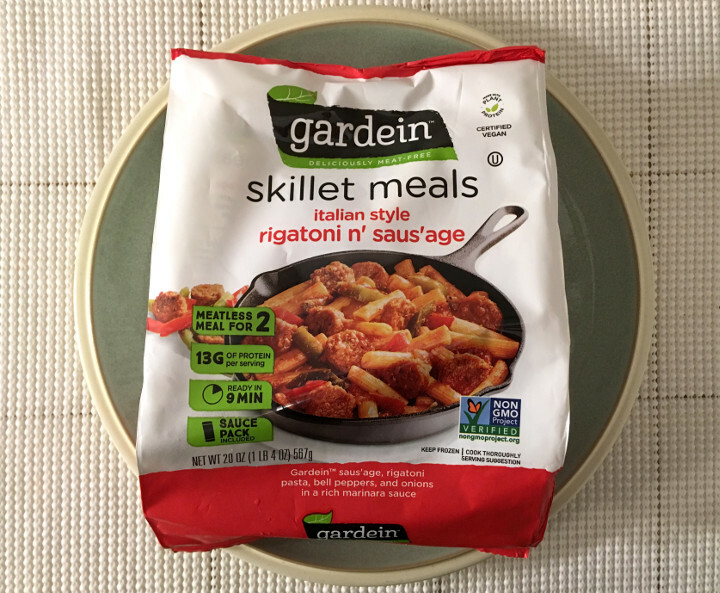 The Gardein Italian Style Rigatoni n’ Saus’age Skillet Meal is certified vegan, and it’s pretty tasty too! 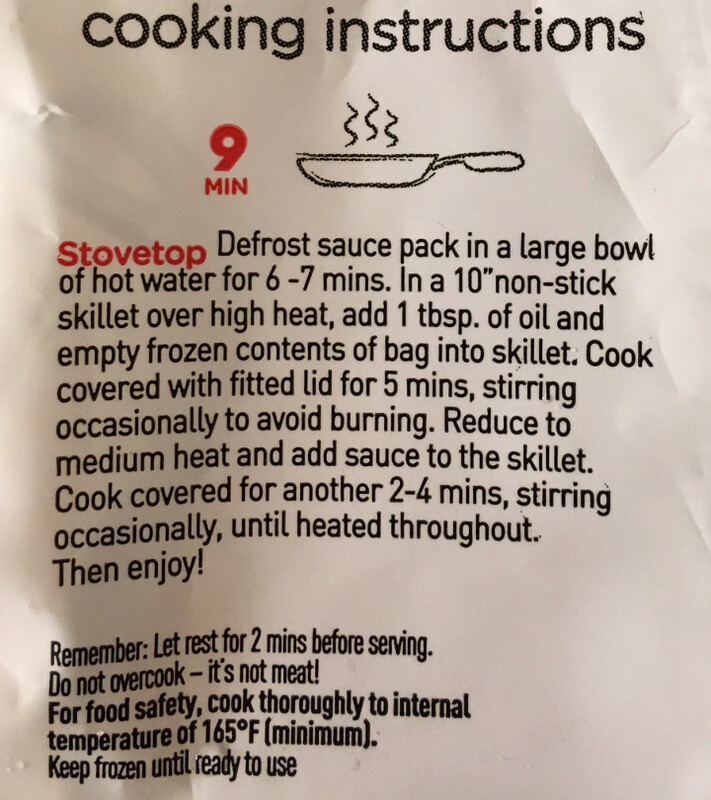 The sauce comes in a separate packet, which is supposed to be thawed in a bowl of hot water before adding it to the rest of the dish. 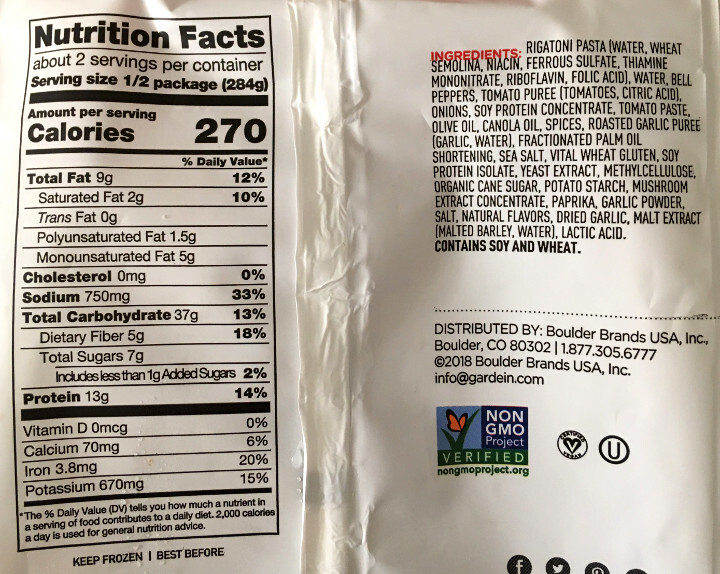 We’ve reviewed a lot of meals that kept the sauce in its own packet, but this particular packet gave us a lot of trouble. As you might be able to tell from the image above, the sauce packet is very thick. It reminds of Lunds & Byerly’s frozen soups, which take about 10 minutes to thaw in boiling water. 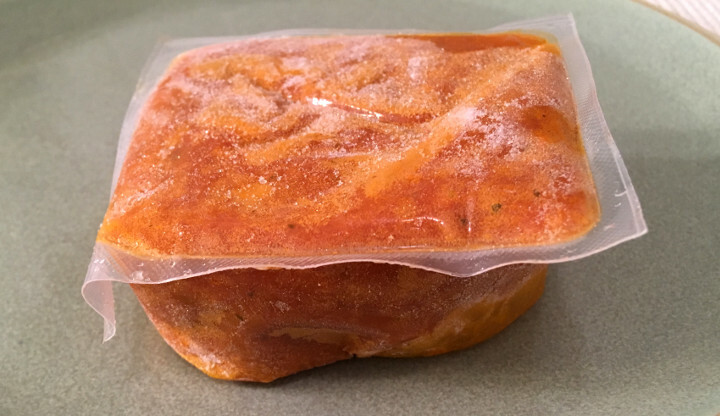 When it was time to add the sauce to our dish, it was still completely frozen in the middle. We wound up tossing in the pan as-is so that we could break it up into smaller chunks and unfreeze it while the meal cooked. We were a little disappointed when we took our first bite of faux sausage. It looks incredible, and the texture is alright, but it’s definitely lacking in the flavor department. Our meat-eating staffers agree that no one is going to confuse this for the real thing. None of the sausage alternatives we’ve tried measure up to Trader Joe’s Italian Sausage-Less Sausage; we wish it could be in every meal. Even though the saus’age let us down, the dish itself is pretty delicious. The fake meat is a lot more appealing when it’s smothered in a tasty tomato sauce, and the texture of the noodles and veggies is perfect. The real star of this meal, however, is the bell peppers. They enhance every other ingredient in this meal. 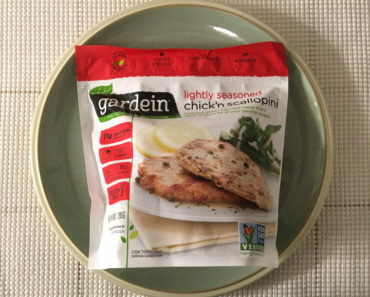 At 270 calories per serving, you probably won’t want to split this meal unless you’re pairing it with a nice big salad. 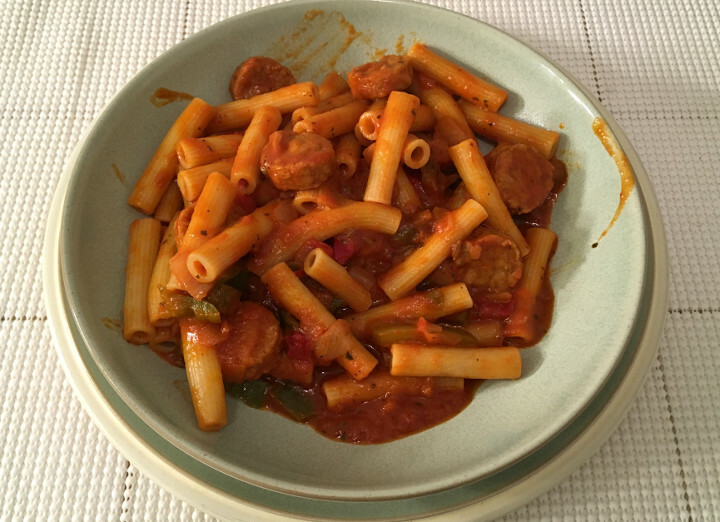 Still, Gardein’s Italian Style Rigatoni n’ Saus’age makes for a tasty meat-free pasta dish. 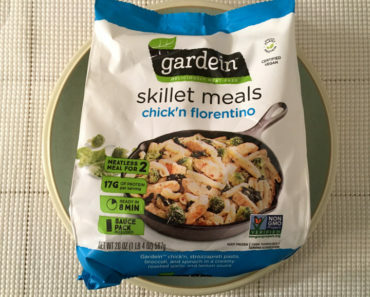 If you’re looking for quick-and-easy meals that are vegetarian-friendly, search for this skillet meal in your freezer aisle. 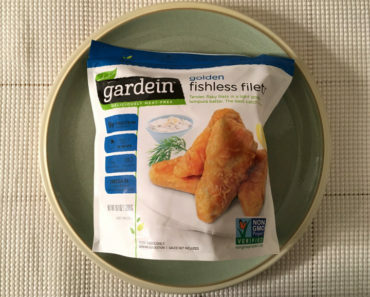 To learn more about the nutrition content, ingredients, or cooking instructions for this Gardein frozen meal, check out our package scans below.